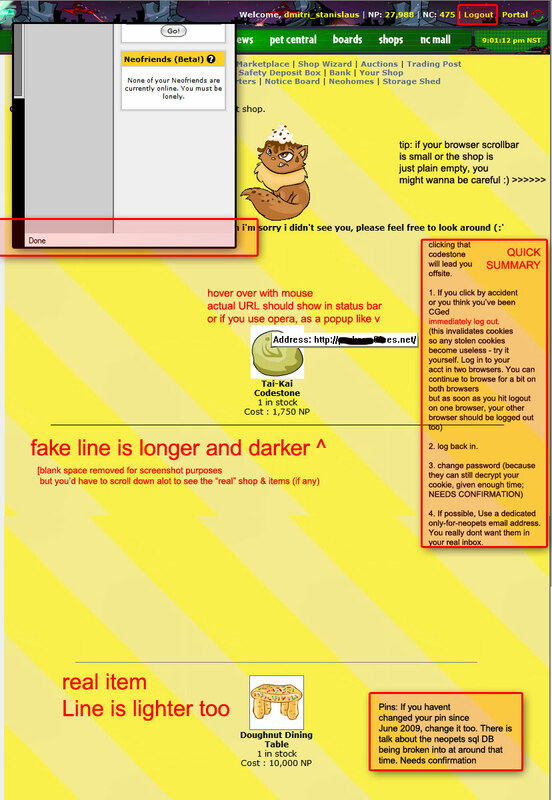 NOTICE: If you are unable to see the images on this page after installing requestpolicy, you would either have to allow requests from neopets.com to neomallers.com or view this page in a browser not associated with neopets, since the images are hosted on the NeoMallers servers. Windows 10 The F8 method to get into safe mode does not work nicely under Windows 10 - especially if you're running an SSD as your boot drive. You will need to do it through the windows environment. (Click start -no_html_comments- type in MSCONFIG. Select the BOOT TAB. Check "SAFE BOOT") Restart. Dont forget to switch it back when you are done. Dec 2015 Added links to NoScript configuration petpage to the useful links section. Nov 2015: Don't be clicking links There appears to be another round of exploits (possibly related with flash) Some users have reported being sent links such as "click the link to see my offer on your trades", etc. Flashblock along with the regular gear (requestpolicy, noscript) is recommended if you decide to visit UL/petpages/etc. Sept 2014: NF Requests/Items: Keep both of them blocked dont visit lookups/user pages when a user you DONT KNOW sends you guild invitiations, NF requests, or items. June 18/2011: DUPED ITEM CGs: Source: Neoboards. Users are asked to search on google claiming that there is a list that shows list of duped items Sample: Google -removed for your safety- (WITH QUOTES!) and click on the first neopets.com result. It's a list of users selling duped items and duped items to watch out for! This is a HUGE problem right now! August 21/2010: 'Inventory': Some users are reporting inventory items disappearing/being sent to others so it is advisable to keep valuables in SDB/gallery. August 8/2010: 'Eye frame' based CGs: be wary of people that neomail you things like "I heard you might be interested. Check my gallery" or "check my trades" Some form of CG probably on lookup and in gallery. August 8/2010: 2nd wave? CGs are on the move again. This time, encoding the CG code. Again, probably wont run correctly in firefox, but IE will execute it. July 27/2010: RequestPolcy vs Noscript. Both or just one? More details on the requestPolicy addon has been added here. Also a glossary has been added too. July 26/2010: What do if you're frozen added to useful links... With the new ticket system, getting an account back might not be so obvious. See below for more details. Link to an external NoScript Guide added in NoScript section. July 25/2010: Filters Updated.... Yesterday, tnt has updated the filters. Opening and closed quotes are now required at every link. Offsite based CG links seem to be still happening however. But it's still progress. July 20/2010: Jhudora.... Do not go to a site with jhudora in the name. It's a php/image based CG. They will say your lookup has been stolen, etc and that you should check it out, etc. July 16/2010: On-site cookie grabbers: Yep Onsite cookie grabbers are back. The code is embedded directly in the shop itself. And noscript will probably not save you (because you would have whitelisted neopets.com and not doing so is against the toc) so it's best not to snipe at this time. This one is embeded within the width property of a style / tag. It probably won't work on firefox browsers, etc, judging from its rather, invalid cod, but will run on Internet explorer. July 12/2010: ARMOURED NEGG: Be careful of really cheap armoured neggs! A real one is masked underneath a fake armoured negg that links to a CG site. they show up normally on the wiz but cannot be bought if you click on it because of the invisble linked layer above it) But if you know how to edit the source code on-the-fly, you can still buy it to remove it from the ssw (so others wont get CGed). Don't attempt this unless you know what you are doing. For more details on cookie grabbing on xss, please see the section on RequestPolicy. - neopets authentication is based on session ids. Clicking LOGOUT deletes the session from the neo server, which renders the cookie (including all copies of it useless) Re-logging in creates a new session but does not delete previous sessions if the logout link is not clicked beforehand. (Try the two browser trick - log into your account on two browsers. You can browse around on both for a bit. Now click logout on one, and your other browser gets logged out too.) Basically everyone gets kicked out. in and change your pw. In most cases, it's easier for him to just move on to the next account in the list. P.S. Clearing cookies don't work either. All it does is remove cookies from your own system. Not anywhere else. A word of advice: Installing these addons can make your browsing experience somewhat annoying (since you have to constantly allow access to trusted websites as you visit them (a huge pain when you are researching for example - where most of the websites you visit are untrusted/new to the addons)... but even then, more advanced sites (such as facebook apps) may still have difficulty loading properly. What you can do is use two browsers - Firefox when you need to visit user pages (or neopets in general), and Google Chrome for your other browsing activities. Then use a free tool like Xmarks so your bookmarks sync and are available from both browsers. Neopets may freeze your account for cheating if you restock while disabling jscript. An easy way to check to see if you have properly configured it is (1) Install Noscript. Go to your inventory and click on an item. You will notice that nothing pops up. This means it is activated and scripts are being blocked. (2) Now configure as outlined below and check again. If the item description pops up, you're good to go! The NoScript Firefox extension provides extra protection for Firefox, Flock, Seamonkey and other mozilla-based browsers: this free, open source add-on allows JScript, Java and Flash and other plugins to be executed only by trusted web sites of your choice (e.g. your online bank), and provides the most powerful Anti-XSS protection available in a browser. You can enable JScript, Java and plugin execution for sites you trust with a simple left-click on the NoScript status bar icon (look at the picture), or using the contextual menu, for easier operation in popup statusbar-less windows. whitelist neopets as one type of CG uses a redirection of http://images.neopets.com/flash_version_check_v1.swf? to steal cookies. to close it. You definitely dont want to find yourself clicking close on a XP antispyware 2009 pop up ad. Those are the worst to get rid of. THE LONG AND THE SHORT OF IT: IF A VALID PAGE is not showing up properly, right click an empty area of the page and whitelist blocked destinations that you TRUST. 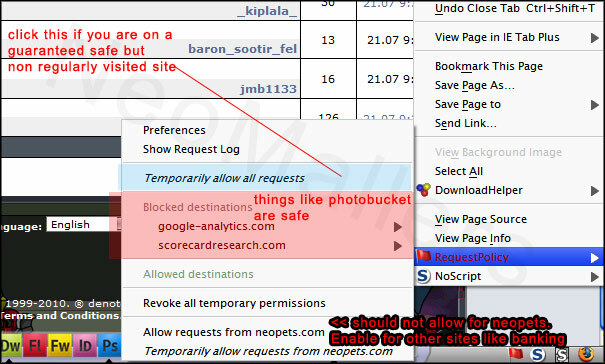 Do NOT select 'Allow requests from neopets.com' as this will allow everything on the page to get through, which defeats the purpose.Basically, this plugin can be used in its default state! Content of the current page that is from a different site. Various tags in an HTML page tell the browser that more content is needed to display the current page. Normally, the browser immediately makes requests to third-party sites to obtain this content. The content can include images, JScript files, style sheet files, and many others. Redirections from the current site to a different site. Redirects tell your browser to load an entirely different website address than the one you are on or requested. Redirections can be caused by JScript, META refresh tags, and Location headers. Is RequestPolicy an alternative or competitor to NoScript? NoScript is a tool that gives you a default deny policy for JScript, Java, Flash and other plugins. NoScript allows you to whitelist scripts and objects from domains you trust. RequestPolicy is a tool that gives you a default deny policy for cross-site requests. RequestPolicy allows you to whitelist cross-site requests you trust. How does RequestPolicy help you where NoScript does not? RequestPolicy will protect you from various attacks that NoScript will not (such as CSRF attacks, though there some special cases that NoScript protects against) and will give you greater privacy while browsing. Also, RequestPolicy will give you finer-grained control over JScript and plugins when you use it with NoScript. For example, if you whitelist a domain with NoScript to allow it to run JScript, then that domain will also be allowed to run JScript when you are on any other site that you have whitelisted with NoScript. RequestPolicy makes sure that when it is JScript from a third-party site, it will still be restricted unless you have allowed those cross-site requests. Conversely, NoScript gives you protection that RequestPolicy does not. RequestPolicy will not keep you safe from malicious JScript or vulnerable plugins on the current site you are visiting, So, NoScript is absolutely essential for browser security. Having two separate tools that each do their specific jobs well is the best approach. NoScript is an amazing extension and is absolutely essential (like RequestPolicy) to using Firefox securely. It is best to use both RequestPolicy and NoScript. http://www.neopets.com/~Skiizzy - CGing Traps and other warning signs to watch out for! Neomail me if you know of any other pages that should be here -thanks! If you used the ticket system, hopefully you did it correctly. for BEST effect if you are infected) - it's better than the actual program since it downloads with a random file name. Viruses love to disable the main program file of popular AVs like Norton and AVG. Cookie: A cookie, also known as a web cookie, browser cookie, and HTTP cookie, is a piece of text stored by a user's web browser. A cookie can be used for authentication, storing site preferences, shopping cart contents, the identifier for a server-based session, or anything else that can be accomplished through storing text data. Cross-site scripting (commonly known as CGing) holes are web application vulnerabilities that allow attackers to bypass client-side security mechanisms normally imposed on web content by modern browsers. By finding ways of injecting malicious scripts into web pages, an attacker can gain elevated access privileges to sensitive page content, session cookies, and a variety of other information maintained by the browser on behalf of the user. Cross-site scripting attacks are therefore a special case of code injection. Cross-site request forgery, also known as a one-click attack or session riding and abbreviated as CSRF ("sea-surf") or XSRF, is a type of malicious exploit of a website whereby unauthorized commands are transmitted from a user that the website trusts. [like neopets for example] Unlike cross-site scripting (XSS), which exploits the trust a user has for a particular site, CSRF exploits the trust that a site has in a user's browser. A cross-site request forgery is a confused deputy attack against a Web browser. The deputy in the bank example is Bob's Web browser which is confused into misusing Bob's authority at Mallory's direction.